1. PEMDAS is not a word. In general, I believe that for mnemonic devices to have the greatest impact, they should be easy to remember words. PEMDAS is not easy to remember and PEMDAS is not even a word. 2. PEMDAS implies to students that there are six steps in the order of operations: Parentheses, Exponents, Multiplication, Division, Addition, and Subtraction, when in fact, there are only four steps in the order of operations. How can we expect students to properly remember the order of operations if we are providing them with such a misleading mnemonic device? 3. PEMDAS should not be used simply because it is the way that students want to be taught. One student told me the other day that he was confused by the way that I was doing the order of operations simply because I was not using PEMDAS. I told this student that he could continue to use PEMDAS if he wanted to, but he would continue to get incorrect answers (He is one of the students who thinks that PEMDAS has six steps). 4. PEMDAS simply does not work. If PEMDAS worked, wouldn’t students actually understand the order of operations? 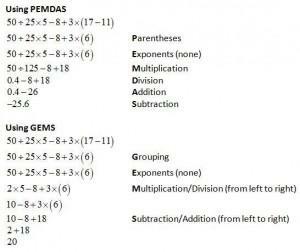 The fact of the matter is that PEMDAS does not help students understand the order of operations. PEMDAS did not work for students when they were in elementary school, why should it work for them in college? I truly believe that my position as a college math instructor requires me to present the material differently than the students saw the material the first time that it was taught to them because whatever they were taught the first time obviously did not stick long term. Although my ultimate goal is to help students refresh their memory, why should I refresh someone’s memory about something that is misleading and simply does not work? 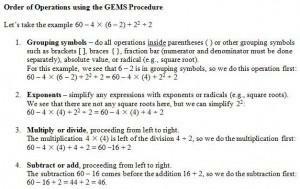 Below is an example of the Order of Operations using the GEMS Procedure. I prefer the GEMS Procedure because GEMS is actually a word and GEMS implies that the order of operations actually has four steps and not six steps. To further prove my point, here is an example of a problem that is incorrectly done using PEMDAS versus a problem that is correctly done using the GEMS Procedure. I know that the GEMS Procedure is not going to become ‘mainstream,’ but I can hope, right? 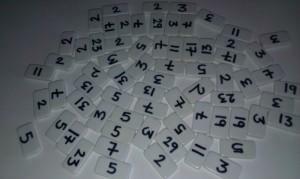 This entry was posted in Uncategorized and tagged Order of Operations, Ramblings on January 23, 2012 by Jon Oaks. One of my biggest pet peeves is when I hear instructors complaining about the lack of professional development activities. There are plenty of conferences to attend, wherever you live (I happen to live in Michigan). I honestly believe that one of the keys to a successful teaching career is attending conferences, networking, and building a personal learning network. To that end, I have compiled the following list of upcoming conferences in Michigan. I hope to see you there (At this point, I plan to attend all of these). This entry was posted in Uncategorized and tagged Ramblings on January 22, 2012 by Jon Oaks. Last weekend I cleaned out my apartment over a period of three days. I was even called a hoarder on Twitter. Anyway, three days and multiple bags of trash certainly give a person a lot of time to think and reflect. The majority of what I was throwing away was papers from when I used to teach at other schools as a part-time instructor. I had to keep the papers at home because I never had an office. What struck me as odd though is looking through all of the student work I had kept from over the years and realizing that I used to have fun in my classes. I used to have students do in-class presentations on famous mathematicians, create games and puzzles related to the unit we were studying, and do a lot of other fun paper-based activities when I first started teaching. But now that I am trying to create more games, activities, and projects for my classes, I actually feel like my classes are less fun than they used to be. The students still think that the classes are fun. I am just saying that my own perspective has changed. Does this mean that I am headed in the wrong direction and that I am headed for doom? Or does it just mean that I am not as naïve as I used to be and I am more focused on the specific objectives of each game, activity, and project? I go into every semester thinking that it will be different, that I will have lots of games and activities for my students to do throughout the semester. But somehow it always turns out that after the first few weeks I begin to get buried in grading and the usual junk that always comes my way as the semester gets underway. I am not sure how to prevent this from happening, except by better planning on my part. 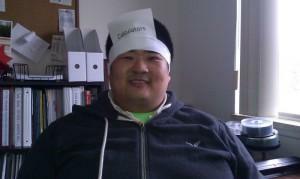 So, what I can I do differently to ensure I will have fun in class, as well as my students? Do not get me wrong, I really enjoy teaching. I tell that to my students all the time. I make sure that my students are very aware that I enjoy and like what I do for a living. But I feel as if I have come to a point where I have taken the fun out of enjoyment. Is it really possible to enjoy something without having fun? I really hope that I am wrong and that I am not headed for doom. 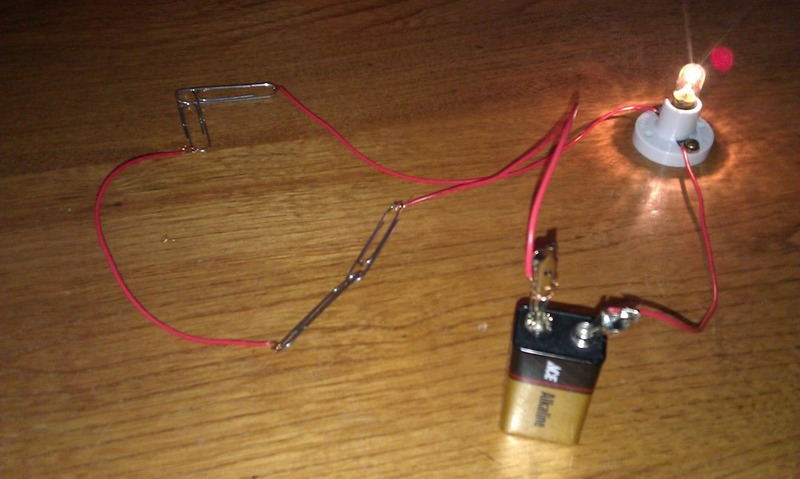 This entry was posted in Uncategorized and tagged Ramblings on January 6, 2012 by Jon Oaks. 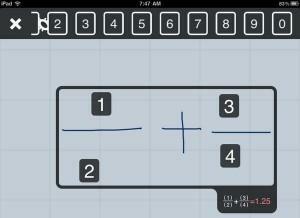 GridPaper is an iPad App that recognizes handwritten mathematical symbols. You can use this App to perform operations and to solve equations. For me, the most frustrating thing about using GridPaper is that it did not come with instructions. When you open the App, there are a few instructional diagrams, but no words explaining what everything does. So, everything I know about the App now came from trial and error. I still have trouble writing certain numbers using the App, pi being one of them. My advice is to write all of the numbers that you want to use first (see the top of the Screenshot above) and then pull them down to do the operations. If you are interested in trying some of the advanced features of GridPaper, such as using variables or pi, you will definitely want to check out the three screenshots provided on the GridPaper Preview Page. I would not have been able to figure out how to write certain characters without the Screenshots. And it took me two months to figure out that those Screenshots were even there since they are not accessible from within the App. Overall, except for the ‘wow factor,’ there I do not believe that GridPaper is a good choice. It could be made better if there were proper documentation and examples that could be accessed from within the App, but without it, the App is just too frustrating to use. I cannot ask students to spend hours upon hours just to learn how to write pi. I would give this App 1 out of 5 stars. 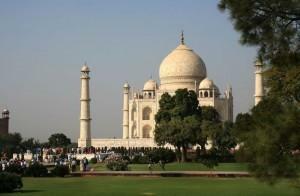 This entry was posted in Uncategorized on January 4, 2012 by Jon Oaks. Last semester (Fall 2011) was my first semester teaching full-time. As such, I have learned a lot of lessons about what bothers me and what does not bother me. However, the biggest thing I noticed is that when certain behaviors bother me now, I actually want to do something to prevent them from happening again in the future. But during my eight years of teaching part-time, I never did anything about it. 1. They are scared. First of all, they are scared about losing their job. Many part-time instructors have multiple positions at multiple schools because they actually need the money. So, if they tell students not to do something, it is quite possible that the students might complain. And the fear among a lot of part-time instructors is that if there are too many student complaints against them, they will be fired. 2. Lack of support. Many colleges I have taught at in the past seemed to have supportive administrators until I actually needed to enforce the rules. When I started to enforce rules, the administration started complaining about the increase in students in their offices due to my enforcement of the rules. Several times, in fact, I was told to just to be quiet and give the students the grades that they wanted. After a while, I just got fed up and just gave up. 3. We’ll never see those students again. As a part-time instructor, I generally taught the same developmental math classes every semester. So, it was very rare that I would ever have a person as a student more than once. Thus, if there was a student who really bothered me one semester, it was very likely that I wouldn’t have that student again since the student would be moving on the next class that I would not be teaching. Problem solved, right? Until the next batch of students arrived. I know I am probably stating the obvious. So, what can we do to change the classroom environment for our part-time instructors? I honestly believe that we need to reach out to them and share our ideas about what has worked for us in the classroom and what has not worked for us in the classroom. I have to say, every semester the first day of class becomes more and more scary for me. I now know it is the most important day in terms of setting the tone for the semester. The very first semester I taught, I was nervous on the first day of class, but not scared. There is a big difference between being nervous and being scared. But none of this means that I have to come to class every day for the next sixteen weeks dealing with behaviors that I should not have to put up with in the classroom. This entry was posted in Uncategorized and tagged Ramblings on January 3, 2012 by Jon Oaks.